Booster Battle is a minigame in DK: Jungle Climber. It is added to the minigame list after the level "Space A Go-Go" from High-High Island is completed. 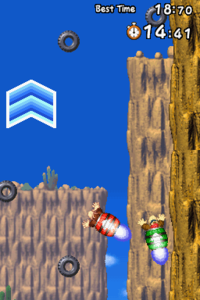 In said level, the player controls Donkey Kong in a Booster Barrel. In the minigame, however, the player races against Funky Kong. The player must finish before Funky Kong to proceed to the next level of the minigame. It takes place at High-High Island and is the last minigame to be unlocked. This page was last edited on April 22, 2019, at 19:44.